It’s not uncommon reviewing new CDs weekly to lose sight of why you chose to listen to music in the first place. I assume that the recording of the seven tracks, bookended by the Hobart-penned Evidential and Bass to Base, must have been a blast for the musicians, as the diversity of the arrangements and the encompassing of many styles – I counted bepop, fusion, funk, soul – opens up a template for pushing the envelope. Intentionally, which makes sense with musicians like pianist Adrian Reid, double bassist Greg Gottlieb, drummer Eric Ford and trumpeter Chris Lee, evidential is a cross pollination of ideas and perspectives which, when delineated by Hobart’s tenor saxophone, or fueled by the bass-drums-keyboard power trio, is a reminder that the litmus test when musicians exchange styles is always how well they play. 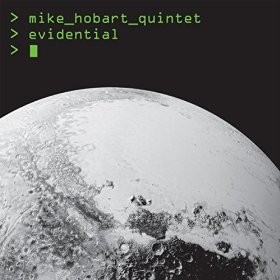 Hobart is in stellar company but he remains the quintet’s catalyst, choreographing the juxtaposition and recontextualising of jazz from a myriad of sources, which makes – naturally – for repeat listening. Evidential navigates the undercurrents of modern jazz and its traditions but in a white water rafting kind of a way. It’s never dull. My late uncle loved the Dave Ballou quintet session On This Day for all the reasons which make Evidential so appealing, striking timbres for adventurous ears: the Mike Hobart Quintet trades and freshens up rhythms and phrases to a common end- joy.